Please note that the content of this book primarily consists of articles available from Wikipedia or other free sources online. The 2001 AAPT Championships was a tennis tournament played on outdoor hard courts at the Memorial Drive Park in Adelaide in Australia and was part of the International Series of the 2001 ATP Tour. The tournament ran from 1 through 7 January 2001. 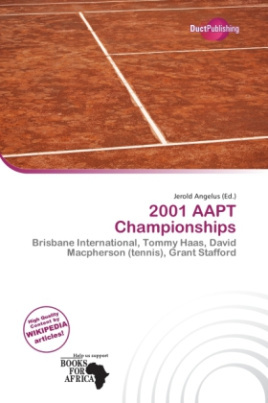 The Brisbane International is a professional tennis tournament played on outdoor hard courts. It is currently part of the ATP World Tour 250 series of the Association of Tennis Professionals (ATP) World Tour and of the WTA Premier tournaments of the Women's Tennis Association (WTA) Tour. It is held annually in January at the Queensland Tennis Centre in Brisbane, Queensland, Australia, just before the first Grand Slam tournament of the season, the Australian Open.